Looking for a healthy summertime recipe that doesn’t require exotic ingredients or a lot of time to prepare? Chloe Long’s got you covered. So do the other 53 winners of the Healthy Lunchtime Challenge. 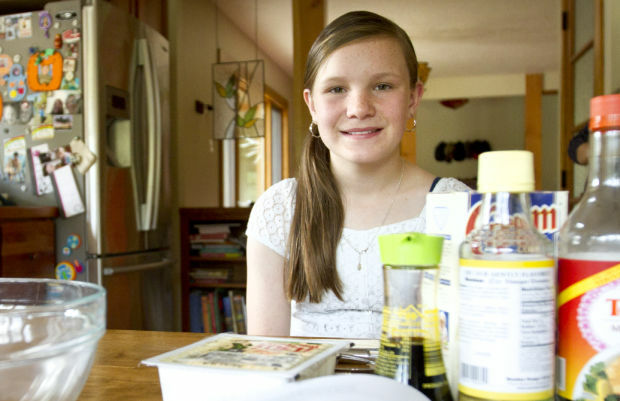 Long, a 10-year-old from Frenchtown, submitted a tofu stir-fry recipe to the national contest and won for Montana. Her original recipe earned her a trip to Washington, D.C., and lunch with First Lady Michelle Obama. Long dished that President Barack Obama made a surprise visit and shared that even the First Family has weaknesses: his is guacamole and chips and hers is French fries. Since she’s been home, Long said she’s tried to continue her healthy ways. For a little inspiration yourself, check out the cookbook with all this year’s winning recipes. Somers/Lakeside food service director Robin Vogler, who helped the Somers Lakeside school district meet the Healthier Montana Menu Challenge, gets a big shout-out in this letter to the editor that came in today. What an inspiration Robin Vogler is. If you see this letter, Robin, would you consider sharing your recipes, or, as a fundraiser, publish a cookbook with menu suggestions from your soup and salad bar and grab-and-go table? Both of my daughters and probably other young mothers would love to have information about how to add vegetables to the menu. When my children were young, I tried to feed them healthy meals and have them look forward to holidays when they could have some traditional family treats only to have the schools ruin Halloween and other holidays by having their own holiday celebrations so the children were stuffed with sugary treats by the time they got home. If that makes me a curmudgeon, so be it. I do grind my own hamburger and pork, but use fresh carrots instead of fat, and you can add kale to potato soup or scalloped potatoes. Kale is packed with vitamins, is very easy to grow, and will last through the winter if protected from snow. I’ve never heard of using carrots instead of fat – but you can bet I’ll be giving it a try. Thanks to Vogler and Redler, I’m rolling in tips on how to make healthier food for the whole family. A teddy bear picnic at a pizza garden? This isn’t some childhood fantasy – it’s real life. Or at least, it will be at noon, when the Children’s Museum will host a group of kiddos (and their favorite teddy bears) at the Western Montana Fairgrounds’ pizza garden (located near the hockey rink). The pizza garden is a pizza-shaped garden filled with living plants that grow good toppings for pizza – plants like garlic, tomatoes and herbs. It’s a gardening opportunity and a picnic opportunity. If you don’t have any lunch plans, pack up a sack lunch and the kids. And if you happen to drive by the festivities – don’t worry, you’re not hallucinating. I took this as her cue that she was hungry, and pulled up a chair so she could help me crack eggs and see what we would be eating. Willow loves to help out in the kitchen, and I’ve noticed that she’s a lot more likely to try new foods that she helped prepare than ones that just suddenly appear on the table. She’ll even eat “that slimy green stuff (retching noise)” so long as I let her scoop out the avocado. And in the summertime, she will eat whatever comes out of the garden. At age 5 now, she could spend hours playing with worms and bugs and sneaking bites of baby carrots and peas. So this morning, it was a treat to read about the Good Food Store selling copies of “The Helping Hands: Lowell School Garden Project Family Cookbook” to help fund the school’s garden. Copies are just $10, and you can find out more by calling Lowell School at 542-4040. Missoula fans of Kathleen Clary Miller, a local writer who lives in Huson, will remember her columns from the Missoulian’s Opinion page every Friday some months back.